Our legacy began in 1902 with the founding of Jewish Hospital School of Nursing with a dedicated to the tradition of learning and to the value of health care without discrimination. The first class of seven graduated from Jewish Hospital School of Nursing. The Jewish Hospital Dietetic Internship founded as a post-baccalaureate certificate program. Through a generous donation, the Moses Shoenberg Memorial School of Nursing Building gave Jewish Hospital School of Nursing students a place to live and study while attending school. The Alumnae Association of The Jewish Hospital School of Nursing pro forma decree from the State of Missouri. The Jewish School of Nursing was one of the first 37 schools in the nation to be accredited by the National League of Nursing (also accredited by the Missouri State Board of Nursing). Jewish Hospital School of Nursing participated in the U.S. Nurse Cadet Corps. Barnes Hospital School of Nursing formed after Washington University closed its affiliated nursing program. Jewish Hospital School of Medical Technology attained accreditation. Barnes Hospital School of Nursing graduated their first nursing class. The Barnes Hospital School of Cytotechnology founded as the medical campus continued to grow. In the 1970’s, Jewish Hospital was the first to treat tumors at or near the skin surface with a combination of hypothermia and radiation treatments. It became the region's first multi-disciplinary center for the treatment of breast, colorectal, lymphoma, thoracic and head-and-neck cancers; giving Jewish Hospital School of Nursing students the opportunity to learn innovative techniques in clinical and patient care. Barnes Hospital School of Nursing announced an affiliation with St. Louis College of Pharmacy. The Jewish Hospital School of Medical Technology became a program within Jewish Hospital School of Nursing. Jewish Hospital School of Nursing affiliation with University College of Washington University established. Missouri Coordinating Board for Higher Education approved Jewish Hospital College. Associate of Science in Nursing (ASN) program granted initial accreditation by Missouri State Board of Nursing. The Jewish Hospital College of Nursing and Allied Health established. Investiture ceremony publicly celebrated the opening of Jewish Hospital College and officially granted the Board of Trustees and President with authority for operating the college. Jewish Hospital College celebrated its first graduation in Associate of Science in Nursing (ASN), Bachelor of Science in Nursing (BSN), BSCT, CT Certificate, and CLS Certificate programs. Jewish Hospital School of Nursing graduated its 90th and last class. At its closing, the school had graduated over 3,600 students. The Barnes Hospital School of Cytotechnology became a Barnes Hospital School of Nursing program by attained accreditation from the American Society of Cytopathology and from the Commission on Accreditation of Allied Health Education Programs (CAAHEP); Associate of Science in Nursing (ASN) program attains full accreditation from Missouri State Board of Nursing. After Barnes Hospital School of Nursing closed, the Barnes name was loaned to the University of Missouri at St. Louis School of Nursing (UMSL) until 2005, in which the name Barnes College of Nursing at UMSL was used. Jewish Hospital College celebrated its first graduation in the Bachelor of Science in Clinical Laboratory Science (BSCLS) program. Jewish Hospital College attained initial regional accreditation as undergraduate institution from the Commission on Institutions of Higher Education of the North Central Association of Colleges and Schools (NCA) retroactive to May 1994. The college was also approved to offer selected graduate level Nurse Practitioner courses leading to a certificate and the Associate of Science in Nursing (ASN) and Bachelor of Science in Nursing (BSN) programs at Jewish Hospital College attained accreditation from the National League for Nursing retroactive to May 1994. The Clinical Laboratory Sciences program was reaccredited by National Accrediting Agency for Clinical Laboratory Sciences (NAACLS). Barnes Hospital and Jewish Hospital were renamed Barnes-Jewish Hospital. Jewish Hospital College attained regional accreditation for its Master of Science in Nursing program by the Commission on Institutions of Higher Education of the North Central Association of Colleges and Schools. North Central Association of College and Schools (NCA) approved Jewish Hospital College’s Neonatal Nurse Practitioner master’s concentration. Jewish Hospital College attains approval to offer the Associate of Science degree in Radiography (ASR) and the Bachelor of Science in Radiologic Sciences - Radiation Therapy (BSRS) by the North Central Association of College and Schools (NCA). Both degrees originated from Mallinckrodt Institute of Radiology at Washington University. North Central Association of College and Schools (NCA) approved master's concentrations in Holistic Nursing and Nurse Educator at Jewish Hospital College. The Cytotechnology Program at Jewish Hospital College was re-accredited by the American Society of Cytopathology. The Bachelor of Science in Nursing (BSN) degree program at Jewish Hospital College was granted preliminary approval by the Commission on Collegiate Nursing Education (CCNE). Jewish Hospital College received approval from the Commission on Accreditation for Dietetics Education (CADE) to offer the post-baccalaureate certificate Dietetics Internship program. The Associate and Bachelor of Science in Nursing degree programs received continuing accreditation for eight years from the National League for Nursing Accrediting Commission (NLNAC) at Jewish Hospital College and the Master of Science in Nursing degree program received initial accreditation for five years. The Bachelor of Science in Nursing (BSN) degree program received accreditation for 10 years from Commission on Collegiate Nursing Education (CCNE) at Jewish Hospital College and the Master of Science in Nursing (MSN) degree program received initial accreditation for 5 years. Jewish Hospital College received continuing accreditation from North Central Association of College and Schools (NCA) for 10 years and received approval from the North Central Association of College and Schools (NCA) to offer the Bachelor of Science in Allied Health, with a concentration in Management; and the Master of Science in Allied Health, with concentrations in Management and Education. The Clinical Laboratory Science program received continuing accreditation for seven years from National Accrediting Agency for Clinical Laboratory Sciences (NAACLS). The Dietetic Internship program, originally established at Jewish Hospital, transferred into a full program at Jewish Hospital College. The Radiography and Radiation Therapy programs received continuing accreditation for five years from the Joint Review Committee on Education in Radiologic Technology (JRCERT). The Radiography and Radiation Therapy programs received three additional years of accreditation resulting in a maximum of 8 years from Joint Review Committee on Education in Radiologic Technology (JRCERT). Jewish Hospital College received approval from North Central Association of College and Schools (NCA) to offer three new graduate concentrations: Master of Science in Allied Health with a concentration in Nutrition; Master of Science in Nursing with concentrations in Oncology Nurse Practitioner and Administration. The Council on Accreditation of Nurse Anesthesia Educational Programs (COA) and the Higher Learning Commission (HLC) of the North Central Association of Colleges and Schools (NCA) fully accredited the Nurse Anesthesia program. The first class of six students entered the program in August. The Respiratory Therapy program received initial accreditation from the Commission on Accreditation for Respiratory Care (CoARC) and was accredited by the Higher Learning Commission (HLC) of the North Central Association of Colleges and Schools (NCA). Barnes-Jewish College of Nursing and Allied Health at Washington University Medical Center become official on January 1, 2005. The Nursing Division received approval from the Missouri State Board of Nursing and the Higher Learning Commission (HLC) to offer two new prelicensure programs: an upper division Bachelor of Science in Nursing (BSN) program and an accelerated Bachelor of Science in Nursing (BSN) program. Classes for both programs began in August. A strategic plan was adopted that called for the closing of the Associate of Science in Nursing (ASN) program as well as the Allied Health programs. Michael L. Evans, PhD, named the Maxine Clark and Bob Fox Professor and Dean of the Barnes-Jewish College of Nursing. The final cohort of Associate of Science in Nursing (ASN) program students started in January of 2007 and they will be the final graduates to complete the program in December of 2008. The final graduates of the Allied Health programs completed their programs in May. The college officially named Barnes-Jewish College of Nursing. 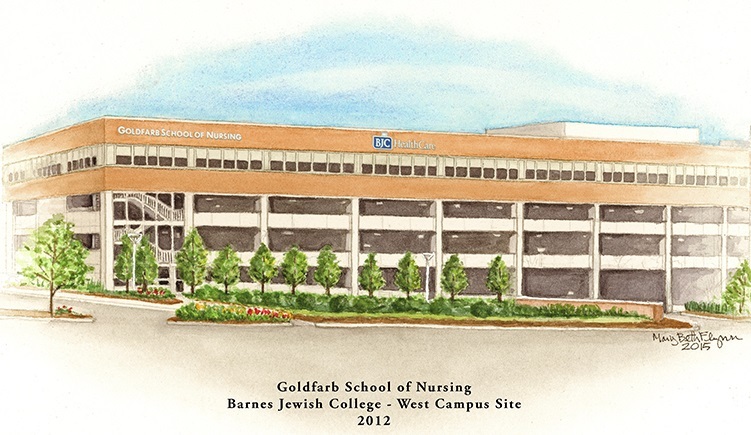 Through a generous donation by Alvin Goldfarb, Goldfarb School of Nursing was established creating Goldfarb School of Nursing at Barnes-Jewish College. Goldfarb Hall, the college’s academic building, opened on the Washington University Medical Center. Goldfarb School of Nursing at Barnes-Jewish College has been named a Center of Educational Excellence by Laerdal Medical, an international leader in medical devices and interactive computer and patient simulators for educating health care professionals. Goldfarb School of Nursing at Barnes-Jewish College has received approval from the Higher Learning Commission (HLC) to offer a new master’s-level nursing program focusing on adult acute care. Goldfarb School of Nursing at Barnes-Jewish College has received approval from the Higher Learning Commission (HLC) of the North Central Association of Colleges and Schools (NCA) to offer the Doctor of Nursing Practice (DNP) and Doctor of Philosophy (PhD) in Nursing program. It is the first nursing school in the nation to offer a concurrent, totally integrated dual terminal nursing degree. Goldfarb School of Nursing at Barnes-Jewish College receives first R21 grant from the National Institutes of Health – National Institute of Nursing Research (NIH-NINR). Goldfarb School of Nursing at Barnes-Jewish College has received approval from the Higher Learning Commission (HLC) to offer its bachelor of science in nursing upper division program at its West Campus Site on the Missouri Baptist Medical Center. The Nurse Anesthesia program, in partnership with Washington University School of Medicine’s Department of Anesthesiology, at Goldfarb School of Nursing at Barnes-Jewish College is ranked 7 by U.S. News & World Report’s 2012 Best Graduate Schools rankings in the specialty of nurse anesthesia. Goldfarb’s master's program ranked 99 among all accredited graduate programs in nursing by U.S. News & World Report’s 2012 Best Graduate Schools rankings. The Goldfarb School of Nursing at Barnes-Jewish College west campus site building, on the Missouri Baptist Medical Center, opened. Michael R. Bleich, PhD, RN, NEA-BC, FAAN named the Maxine Clark and Bob Fox Professor and Dean of Goldfarb School of Nursing at Barnes-Jewish College. The Clinical Simulation Institute at Goldfarb School of Nursing at Barnes-Jewish College was awarded accreditation by the Society for Simulation in Healthcare (SSH) in the area of “Teaching/Education Standards and Measurement.” Goldfarb School of Nursing is only one of 21 international centers awarded the accreditation. The United States Department of State and the J. William Fulbright Foreign Scholarship Board, for the first time, awarded a Goldfarb professor a Fulbright Scholar grant. Goldfarb School of Nursing at Barnes-Jewish College graduates its first student to receive dual degrees as a Doctor of Nursing Practice and Doctor of Philosophy in Nursing (DNP/PhD). Goldfarb School of Nursing at Barnes-Jewish College was recently honored by the American Assembly for Men in Nursing (AAMN) with the 2013 “Best School of Nursing for Men” award. Michael R. Bleich, PhD, RN, FAAN, FNAP named president of Barnes-Jewish College. Barnes-Jewish Hospital funds the first endowed chair for advancing nursing at Goldfarb School of Nursing at Barnes-Jewish College.